YoYoExpert Blog & Yo-Yo News – 3 new TopYo Releases! Photon, Colossus 4, & Neptune TiSS! The new Top Yo PHOTON was designed to pay homage to the classic undersized throws of the past while meeting today’s high performance standards. It may be small, but it packs some serious power! This bi-metal yo-yo has a 7003 Aluminum body with some really fat 7075 Aluminum rings. The denser 7075 Aluminum gives the Photon a great weight distribution and some extra durability for those inevitable drops and dings. It plays stable, has excellent spin time, and the small diameter gives it a really fast maneuverable feel in play that is just a joy to throw. Whether you like smaller yo-yos or just want to try something new, the Photon is an excellent choice at an unbeatable price! The original Neptune was one of the first TopYo models we carried and now they’ve taken it to the next level with a Titanium/Steel bi-metal version! The Neptune TiSS! Titanium/Steel bi-metals are already pretty special, but TopYo decided to change up their machining process to give the Neptune TiSS that little something extra! 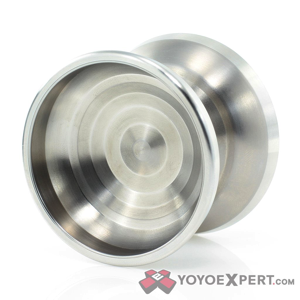 Instead of machining the body of the yo-yo and the weight ring separately, TopYo put the steel rim on the yo-yo body first and then CNC machined the profile shape. This gives the Neptune TiSS a completely seamless transition between the body and ring for an ultra premium final product! The Neptune TiSS has a powerful feel in play with a lighter presence on the string than you would expect from the weight. It moves fast, maneuvers with ease, and has enough spin time to push through any combo. Only 20 pieces produced!